Not only can it juice wheatgrass, the Z Star can also extract great-tasting and nutritious juice from a variety of fresh fruits, vegetables, and leafy greens. The Z Star is lightweight, portable, and versatile, so you can enjoy fresh juice wherever you go! You just need to clamp down the lightweight and durable Z-Star Manual Juicer on a smooth surface and feed in your preferred fruits or vegetables. The Z-Star Manual Juicer comes with all parts you need to juice. You get a juice container, a stainless steel juicing screen, and a plunger. 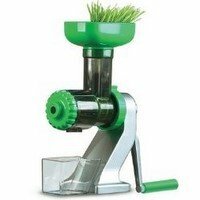 Star Rating 4.5 User reviews, ratings, and feedback indicates that this juicer is rated higher than average by 15 users and ranks in the top 19% of juicers.